Michael Smith, from Petersfield, Hampshire, updates his local community on the gardening services he offers. My story will probably be no different to many others you will hear given our current economic climate. Since leaving university I have worked in Finance and for the past 3 years in Recruitment. Just after the birth of my second child in March I was made redundant and faced the surprisingly harsh job market like many others at this time. 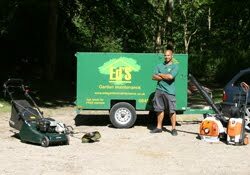 This has given me a fantastic opportunity to combine my love for the outdoors with the desire to run my own business with an Eds Garden Maintenance Franchise. The franchise has enabled me to get up and running from day one and in my first three months I have been exceeding my business plan targets. I am extremely excited to be able to bring Eds to Hampshire. Since getting going I have been overwhelmed by the support and encouragement from my neighbourâ€™s in Herne Farm, Petersfield â€“ Thank You. My businessâ€™s success comes from providing a prompt, reliable and professional service which to date my customers have provided positive feedback. Autumn/Winter â€“ Scarifying and aerating lawns, leaf collection and clearance, gutter and fascia cleaning, mulching, jet washing.